Psoria-Gold improves the appearance of red, scaly, and irritated skin, thus promoting healthy skin and regrowth of the epidermal barrier. 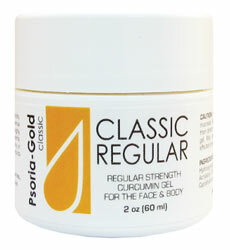 CLASSIC Regular 2.0 oz (Improved Classic Regular formula): Best selling 2 oz jar for the body. Easy to dispense a larger quantity when used on body and scalp. This new Psoria-Gold® Classic regular formula is now made with more curcumin, the active ingredient which gives turmeric its phosphorylase kinase inhibition properties. This new formula is now more spreadable, which allows easier application for larger areas such as the body, or the face/chest area. Formulated to be less drying. PATENTS: US patent number: 5,925,376. Additional US and international patents pending. Manufactured in the USA by Omnicure, Inc.